For decades, small town life in the United States has been quietly eroding. But there are overlooked stories amidst the talk of America's economic decline: the stories of individual men and women in the "Rust Belt" community in Lewistown, Pennsylvania. Once one of the country's largest steel manufacturing centers, Lewistown lost its manufacturing base and industrial might a generation ago and has since become a "ghost town." DOWNTOWN DREAM follows the lives of five dynamic men and women living in Lewistown who refuse to be counted out and instead struggle to reinvent their lives and their dreams in America's chilly economic climate. Over the course of two years, in DOWNTOWN DREAM, viewers witness five compelling personal journeys that also concretize the struggles of the town itself. Jon, a developer, reflects Lewistown's wistful remembrance of nobler days; Bernard, a pastor and one of 150 African Americans in Lewistown, embodies the town's potential resurrection; Pam, a would-be salon owner, reflects the can-do spirit that may be a remedy for Lewistown's business community; Barb, a recovering addict, and Katie, her daughter and an aspiring actress and singer, personify its potential physical rehabilitation. Lyrical and intimate, the film reveals typical Americans in a typical American place grappling with the question on everybody's lips today: How do you make it in America anymore? 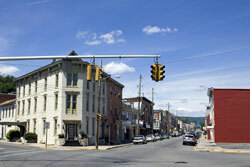 After more than 40 years of decay, Lewistown is now at a crossroads. The town leaders have drawn up a comprehensive redevelopment plan, and it is taking shape. In order to beautify the deserted downtown, streets have been widened, trees have been planted and buildings have been razed. The centerpiece of the plan-spending $250,000 in state funding to install a park in the town's center-is underway. The situation in Lewistown mirrors the fate of the nation at this critical point in history. How do Americans make sense of economic and political forces beyond their control? Will they make a go of it and if so, how? In DOWNTOWN DREAM, Jon, Bernard, Pam, Barb and Katie reinvent their dreams in the face of devastation and decay. Meet Willie, Steve and Jerry, D.C.'s experts in pin-striped suits and feathered hats. How long can they stay in business? Over 100 people at homeless shelters, food banks, and job training centers discuss their experiences of poverty.